HorseMove Ltd specializes in helping owners with Horses that are reluctant to load or are considered bad loaders. We offer competitive packages where we will come to your yard and teach your horse to load calmly. We are kind, caring and knowledgeable horse people. Our lorries have low ramps and are inviting bright airy spaces. 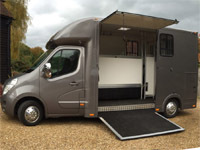 Our partitions and ramps are easy to operate making the whole experience stress free. We will share our knowledge and teach you how lo load your horse calmly without any stress or cruelty. 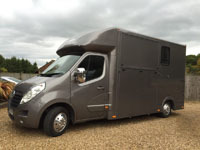 10 minute consultation explaining the loading process and to discuss your horses previous problems and issues. Up to 2 hours loading practice and teaching the loading technique. Advice and assistance to help owners to load confidently by themselves. A short journey at the end of the session to accustom the horse to travelling. 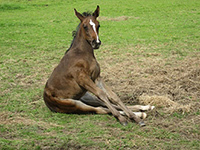 Is there more than 1 horse at your yard that needs our help. If so discounts for extra horses will be given. T&C apply. The above prices include mileage up to 60 miles to travel to yard. Mileage is charged round trip from base. No guarantee can be made that every horse will load. Some horses even with the best professional knowledge and equipment will not load. Other Horses may require several sessions to enable them to become totally confident with loading and travelling.